Oral Submucous Fibrosis (OSF) is an extremely discomforting oral condition that is marked by the development of painful lesions inside the mouth that refuse to go away on their own. Know all about the disease, including its possible causes, symptoms, diagnosis and treatment options. 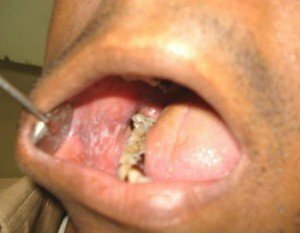 This is a highly potent and chronic pre-cancerous condition that affects various portions of the oral cavity as well as the pharynx. It causes progressive fibrosis of submucosal tissues and juxta-epithelial inflammatory reactions. This disease also leads to fibro-elastic changes in the lamina propria along with epithelial atrophy, which results in stiffness of the oral mucosa. It may become impossible to open to the mouth due to the extreme stiffness of the jaw. 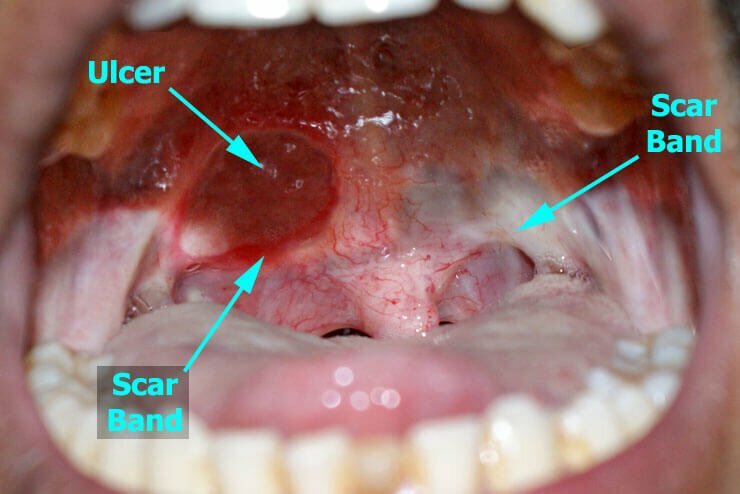 The name of the condition has been derived from the words “oral” (mouth), “submucosal” (below the mucosa or mucus secreting membrane of mouth) and “fibrosis” (scarring and hardening). The disorder can affect people from all over the world. However, its prevalence is higher in places like South Africa, South-East Asia sand Middle East. Both adults and children can develop the condition. In this stage, the mucous membrane of the mouth is inflamed. This is marked by the development of lesions in the mouth, oral mucosa blanching as well as circular and vertical palpable fibrous patches in and around the mouth. This gives a mottled appearance to the buccal mucosa. It is identified by the presence of Leukoplakia and various speech and hearing difficulty. It is the earliest stage of the disorder and does not include any limitations in opening the mouth. Patients having an interincisal distance above 35 mm are included in this group. It refers to those OSF patients who have an interincisal distance between 26 and 36 mm. It includes moderately advanced cases where the interincisal distance of the patients is from 15 to 26 mm. These patients have fibrotic bands on the soft palate while anterior pillars of the fauces are also present. Patients in this group have severe trismus and their interincisal distance is less than 15 mm. Extensive fibrosis of the entire oral mucosa is also present. In sufferers included in this group, the condition reaches an extremely advanced stage with the oral mucosa undergoing premalignant and malignant changes. The change in oral mucosa may be triggered by a chronic exposure to chili, betel nuts and pepper as well as a deficiency of zinc and iron. The mucosa eventually becomes hypersensitive towards these irritants. In many cases, this hypersensitivity results in juxta-epithelial inflammation which leads to an increase in the fibroblastic activity. This leads to the formation of collagen fiber in the lamina propria. The collagen fibers are non-degradable, which results in reduced phagocytic activity. OSF is a completely preventable disorder. Avoiding chewing betel nut as well as mouth fresheners containing this eatable significantly reduces the chances of developing OSF. One should also limit the amount of chilies consumed. Having plenty of chilies may damage the oral mucosa and lead to this disorder. OSF is generally diagnosed by studying the signs and symptoms exhibited by the patient. Doctors thoroughly study the medical history of patients and ask whether they have chewed betel nut or any similar substance. No laboratory tests can confirm the presence of this pre-cancerous condition. However, some recent researches show that OSF patients are likely to have decreased hemoglobin, iron, protein and vitamin B complex levels in the blood. The erythrocyte sedimentation rate is also believed to increase in these patients. At present, modern diagnostic tools like ultrasonography and x-ray are being used for detection of this disorder. A doctor generally prescribes hydrocortisone (Efcorlin) in the form of chewable pallets. Patients have to chew one pallet every 3-4 hours every day for 3 to 4 weeks. Administering kenacort injection has also proved to be useful in curing OSF. In severe cases of the disorder, hydrocortisone 100 mg injection is administered into the submucosal area once or twice every day. The injection helps to relieve the symptoms and is continued for 2 to 3 weeks depending on the individual requirements. Two to three milliliter of Placentrax (human chorionic gonadotrophins) can also be administered through submucosal injection 2-3 times a week for 3 to 4 weeks. Routine management of OSF involves an additional Pentoxifylline (Trental) therapy. It is a methylxanthine derivative with vasodilating properties which can increase the mucosal vascularity. Regular exercise of the mouth helps to improve its range of opening. Thus, Physiotherapy can be useful in the management of OSF. Surgery may be required if the Fibrosis continues to progress despite all the above treatments and the interincisal distance gets below 2 cm. Various surgical treatment options adopted for remedying this condition include simple excision of fibrous bands and creating lingual pedicle and nasolabial flaps. It is a latest treatment option used for curing OSF. According to a recent study, KTP-532 laser release process has been successful in increasing the opening range of the mouth in several patients over a twelve month follow up period. Recent researches have proved the effectiveness and safety of intra-lesional injection of the autologous stem cells of bone marrow for treating OSF. Studies show that this injection stimulates angiogenesis in the affected area, which reduces the degree of Fibrosis. This significantly increases the opening range of the mouth. Ayurvedic and homeopathic treatments can successfully treat this condition. However, it is not recommended to consider these alternative treatment options in severe cases of the condition. With the use of proper treatment, the prognosis or outcome of the disorder is positive in most patients. OSF can be cured completely when treated at an early stage. The following images show how this precancerous disorder affects the inside of the mouth. OSF is a serious oral disease. Early diagnosis and timely treatment can cure it completely, allowing patients to have normal oral movements. However, if left untreated, it can lead to serious health conditions such as oral cancer.